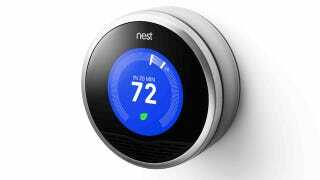 Instead of those damn up and down buttons, the Nest employs a dial to adjust your home's temperature. The unit displays the current temperature and glows red if the heater is enabled and blue if the A/C is keeping you from sticking to your chair. After a week of spinning the household-temperature dial, the Nest actually learns your schedule and begins to set the temperature on its own.